Dive Journal: During our surface interval, we decide to attend a free Advanced Buoyancy Workshop sponsored by the Sand Dollar Dive Shop. This is not a certification course, but is rather intended to assist divers in protecting the Bonairean reefs as much as possible from diver damage. We meet with instructor Willco around 10:45AM, watch a PADI film, and then suit up with Willco in the water off the pier steps. It is a good workshop that helps us adjust our weights, and we perform various buoyancy control maneuvers such as fin pivots (pin fivots), hovering, swimming through diamond-shaped hoops while rolling, and finger pivots. We end the workshop with lots of air left in our tanks, and so Willco allows us to use it out over the reef as a freebie dive and to practice what we've learned. 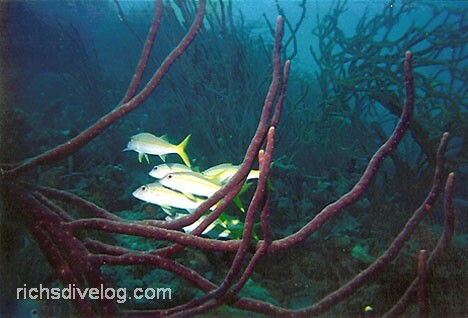 We observe grey snappers near the dock underneath the Green Parrot restaurant. We also see two very beautiful white-spotted filefish, one in orange phase and the other in white-spotted phase. Gorgeous fish! There are also yellow and spotted goatfish about, a juvenile yellowhead wrasse, and a number of black and Nassau groupers to be seen. We dive to 64 feet and stay down for about 50 minutes. Back up on the dock, we express an interest to Leo in diving at the Salt Pier tonight. He must call and receive a fax from the harbor master there for permission, and he promises to do so. Lunch is plain and good - cheese dogs on rolls, leftover spaghetti, and more of the good garlicky sauce Myron made. Following lunch, Myron and Mercedes decide to nap, while Linda and I head down to the dive shop to pick up our permit. We then decide to jump in the van and head into Kralendijk. We spend some lazy time shopping for tee shirts, postcards, and looking unsuccessfully for a "Save Klein Bonaire" bumper sticker I've seen on a few cars around town. It's pretty hot and humid in town, and when we're finished we are both dead-on-our-feet exhausted. At 4:00PM Linda and I sleep, and are awakened by Myron around 6:00PM for dinner. We enjoy a plate of Penne pasta, chicken, and fried onions - very good.